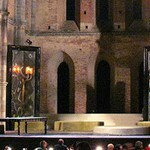 One of most beautiful cathedrals in Tuscany and a magic place if you love the Arthurian legends. 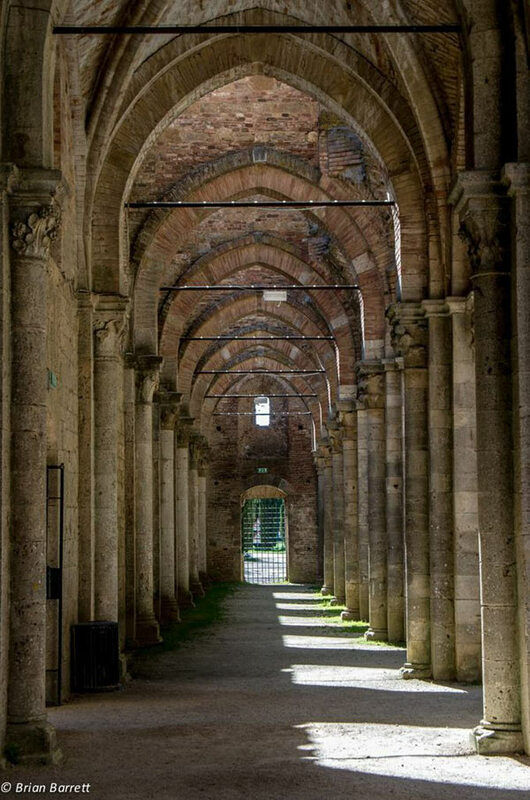 I have wanted to write a post about the fabulous Abbey of San Galgano for the longest time, never getting around to writing it. The beautiful photos that some guests of Casina di Rosa, our vacation rental house near Siena, sent us have finally given me the opportunity to sit down and write this post. 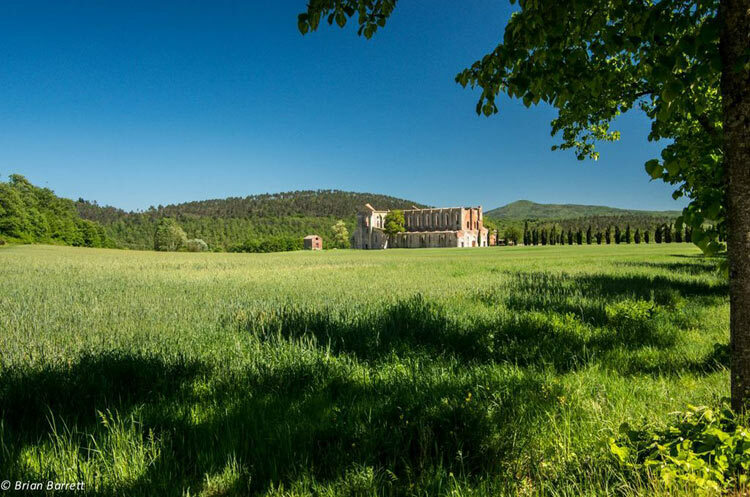 San Galgano Abbey is relatively off-the-beaten-path and yet, I believe, one of the most deserving monumental complexes in Southern Tuscany. It is a very easy daytrip from our village, and the destination of so many of my first day trips with friends (and no parents!) when I was a teenager! 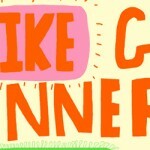 So I might be biased, but if you keep reading, you will see why! 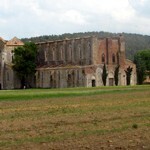 San Galgano Abbey is one of the most beautiful monuments in Tuscany. The unique mystic and mysterious atmosphere of the place and the many legends which surround the origins and the history of the abbey and the monastery attract many visitors all year round, yet it is still outside the major tourist routes. 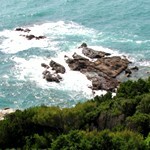 This means that this is a wonderful place which you can still visit without the crowds. 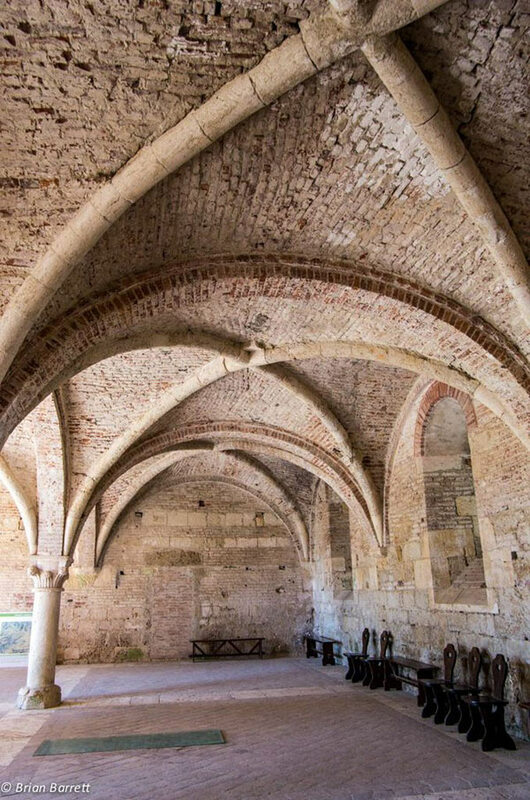 The site is made up of two major attractions: a gothic roofless cathedral and an unusually shaped chapel, the monastery of Montesiepi, an ancient hermitage which hosts the tomb of San Galgano and “the” sword in the stone. If this makes you think of the Arthurian legends, you would be right: many scholars believe that, quite surprisingly, this is exactly where the Arthurian legends originate. Quite far from Britain! 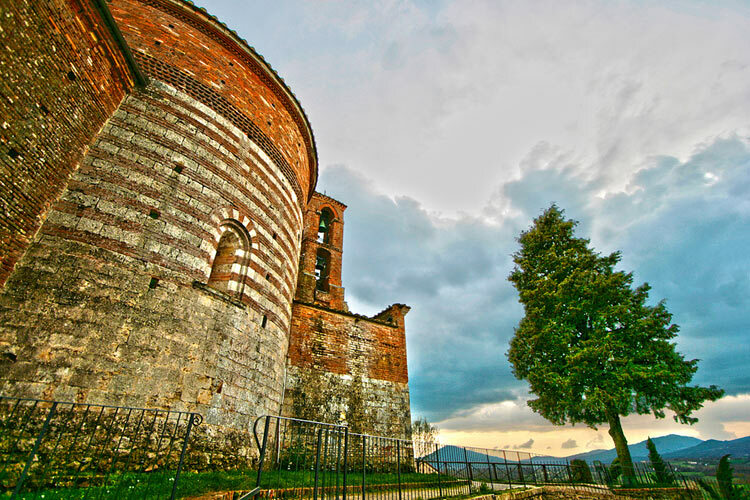 Galgano Guidotti was a dissolute knight who lived in the village of Chiusdino (also well worth a visit) in the second half of the 12th century. The Archangel Michael appeared to him one day, convinced him to repent and showed him the way to salvation. Sir Galgano announced his intention to become a hermit and live in a cave, but his friends and family made fun of him. His mother Dionisia convinced him to wear his noble robes and go to Civitella Marittima (our village, that’s right!) to see his fiancée Polissena Brizzi for the last time but along the way Sir Galgano’s horse reared and the knight fell. He suddenly felt some force helping him to get back on his feet. 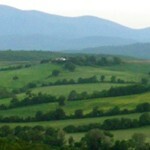 The knight heard a seraphic voice which he was unable to resist and this led him to Monte Siepi, a rugged hill near Chiusdino. There he had the vision of a round temple and of Jesus and the Holy Virgin Mary with the Apostles. The voice guided Sir Galgano to the top of the hill and invited him to give up his sinful life but the knight was hesitant and wittily replied that, even if he thought he should indeed change his life, changing would be as hard as splitting rocks with his sword and in saying this, he drew his weapon and thrust at a stone, fully expecting the blade to snap. To his great surprise, the sword cut the stone and entered into the rock to the hilt! Sir Galgano did not leave the hill ever again. He lived in poverty, with wild animals as his only companions. The legend says that the Devil sent an evil man in a monk’s disguise to murder Galgano but the wolves that lived with him tore the man to pieces, leaving only his hands. 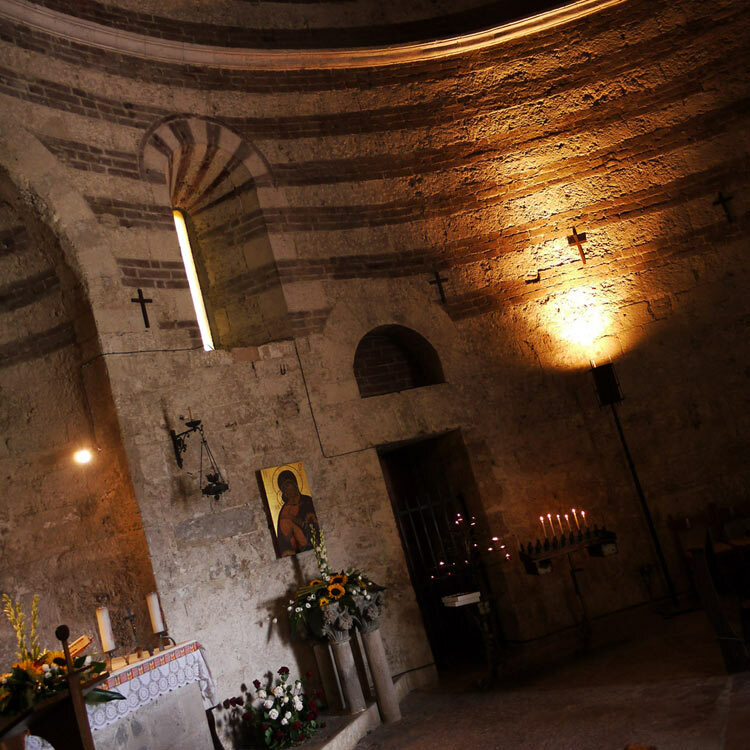 If you are skeptical, you need to take a trip to the hermitage of Montesiepi! 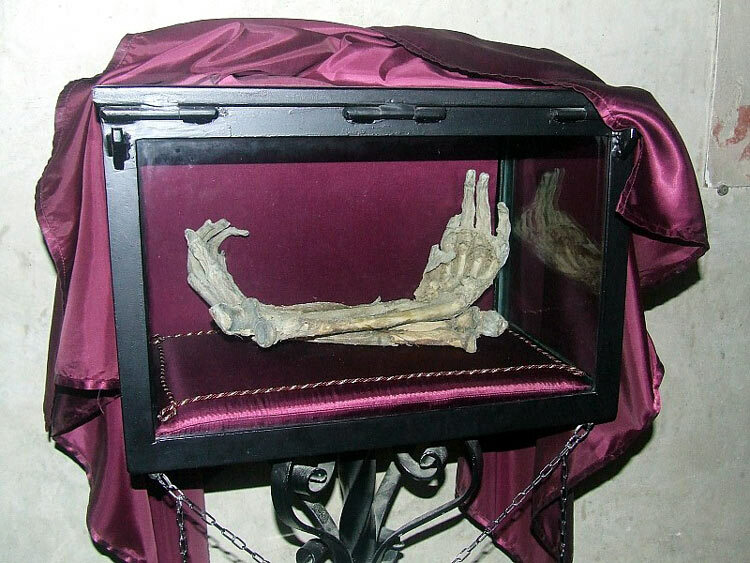 The sword in the stone and the hands of the evil man can still be seen in the church of the monastery, built at the end of the 12th century as a mausoleum for the saint. 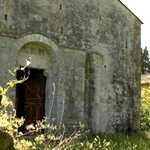 Saint Galgano is buried in the church. 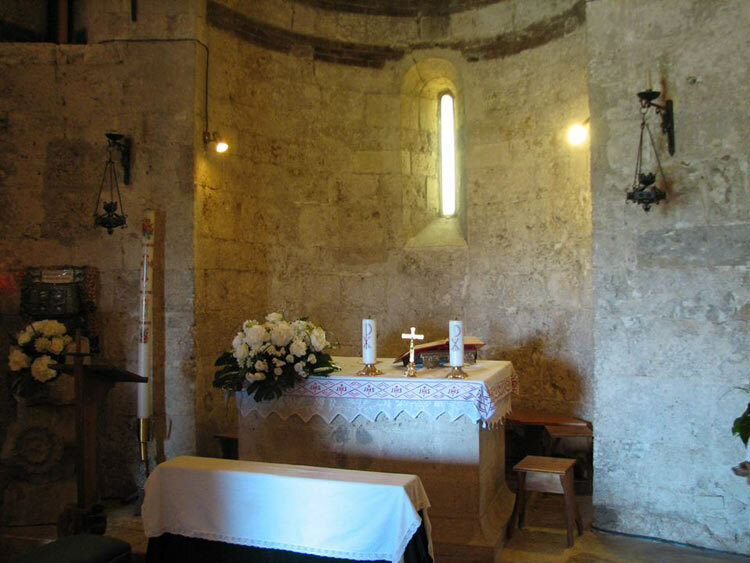 The church has a very peculiar shape: it is built as a “rotunda” and historians hypothesize that it was inspired by Castel Sant’Angelo, the Pantheon in Rome or even an Etruscan tomb as the many ones visible in Volterra, the town that once controlled this area. 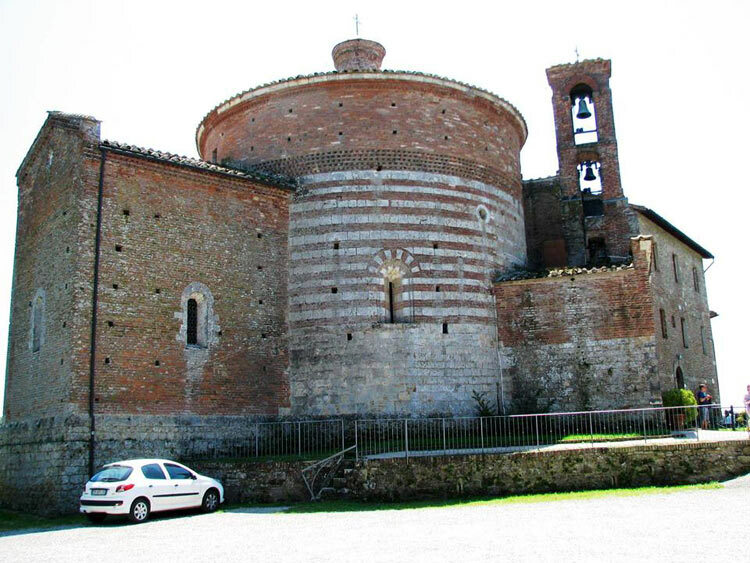 The church was enlarged in the 14th century with the construction of a chapel with frescoes by the Sienese painter Ambrogio Lorenzetti. 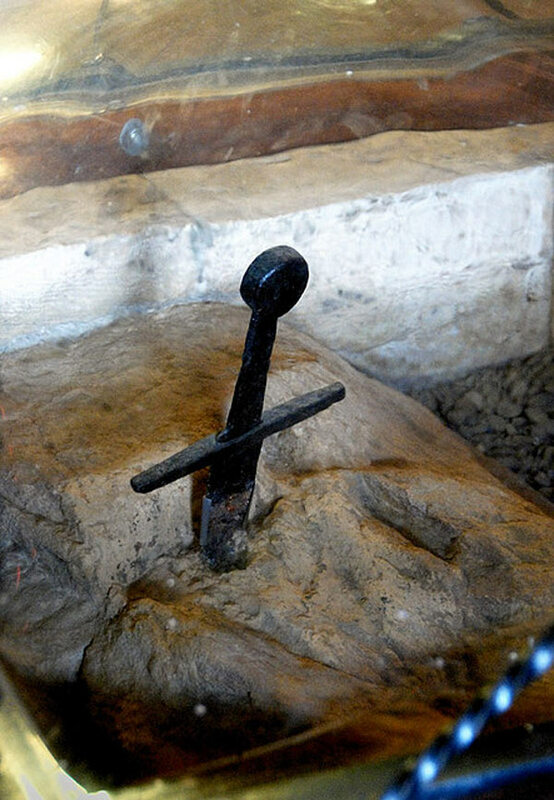 Over the centuries the sword in the stone and its legend have fascinated pilgrims and visitors from around the world. The many resemblances to the tales of the Arthurian cycle have probably not gone unnoticed. 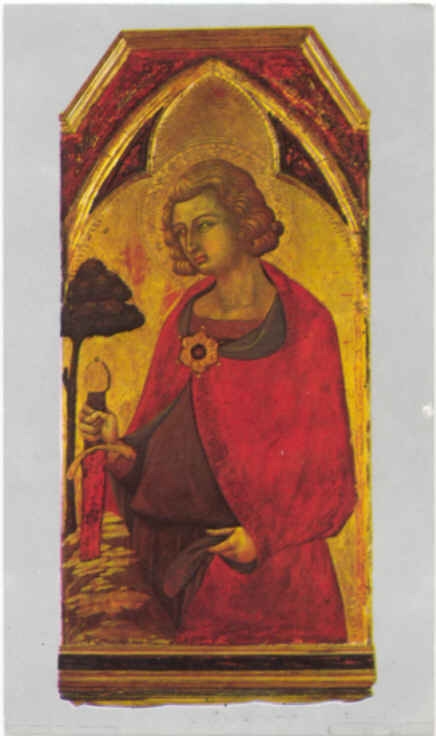 Many scholars have pointed out the striking resemblance of the name of the saint, Galgano, with that of one of the knights of the Round Table, Sir Galwyn, who, by the way, was of Roman origin. Other scholars have insisted on the resemblance to the youngest of King Arthur’s knights’ name: Sir Gawain. proposes an interesting explanation for all these coincidences. The author claims that the story of the sword in the stone originated in Tuscany, in Italy and not in the Celtic fringes of Britain or in France as many believe and that it was added to the legend of King Arthur later on. Moiraghi supports his hypothesis with scientific tests which date the sword embedded in the rock in an abbey in Tuscany to the year 1180, years before the first attested literary reference to the sword in the Arthurian Cycle. The author also stresses how the inquiry which led to the canonisation of Sir Galgano contains a series of facts identical to the legend of Sir Percival, the finder of the Holy Grail. Cistercian monks, whose responsibility in the diffusion of King Arthur’s legends is widely acknowledged. 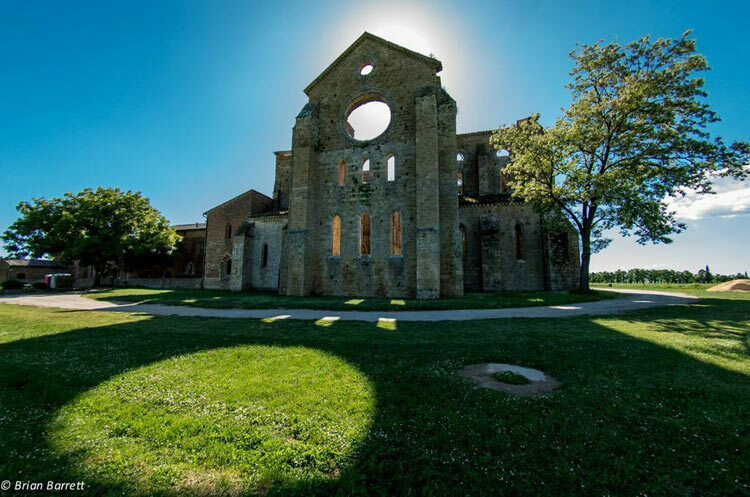 Moreover the Abbey and the chapel dedicated to Saint Galgano and King Arthur’s tomb in Glastonbury date back to the same period and this offers yet another link between this magic place in Tuscany and the most legendary of all kings. 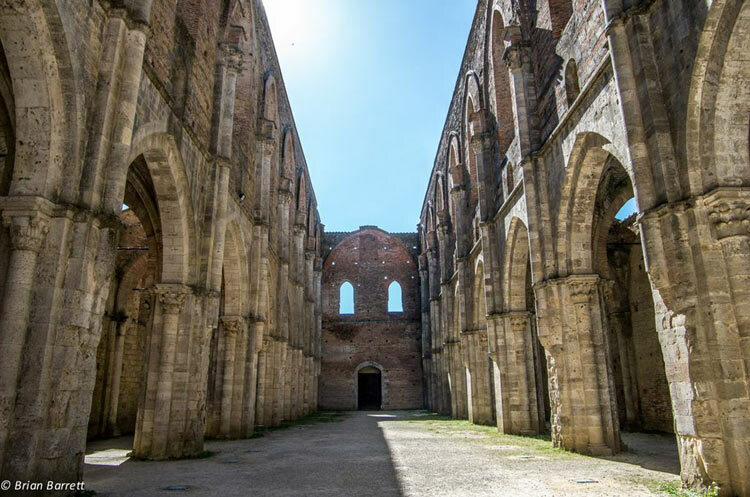 The Abbey of San Galgano was built in the 13th century when the old chapel and monastery became too small for the pilgrims who visited the tomb of the saint from Siena. 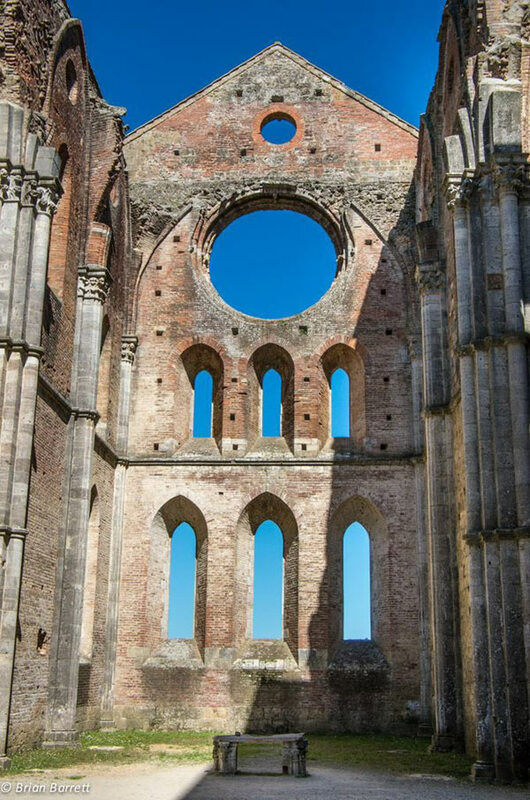 Saint Galgano Abbey was Tuscany’s first pure Gothic church, and it was later used as the model for the Cathedral of Siena. The abbey is built according to the typical Cistercian plan based on a Latin cross with three aisles, rich in carved capitals and rose windows, with a cloister, halls, and, atypically, a bell tower. 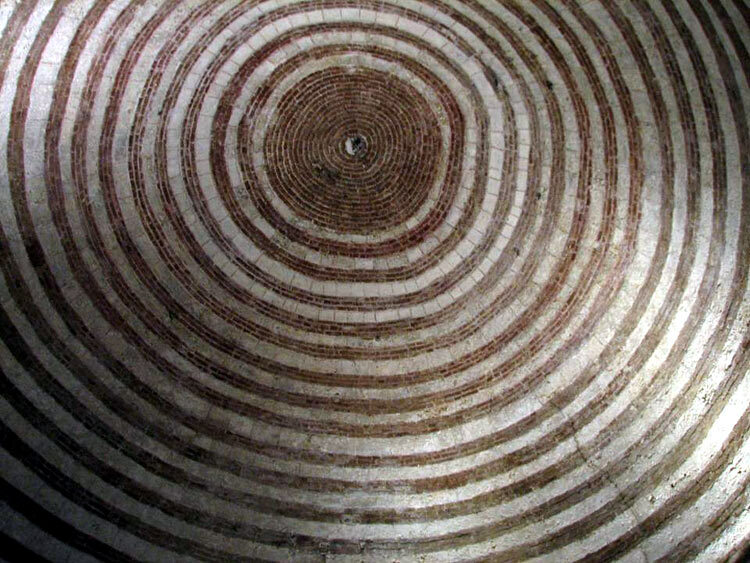 Over the centuries the rivalries between Siena and Florence condemned the abbey to a slow but irreversible decline, and at the end of the 18th century the bell tower collapsed destroying a great part of the roof of the church. The abbey was abandoned and the bricks and stones were used by the builders of the area to build houses and other small churches. 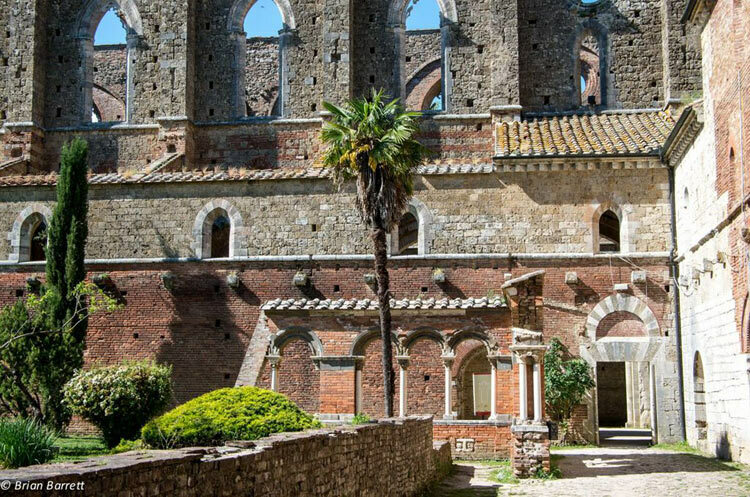 Thanks to several restorations the cathedral is now one of the most beautiful and fascinating ruins in Tuscany, and it is well worth a visit. that Napoleon had stolen the supposedly golden roof of the cathedral. 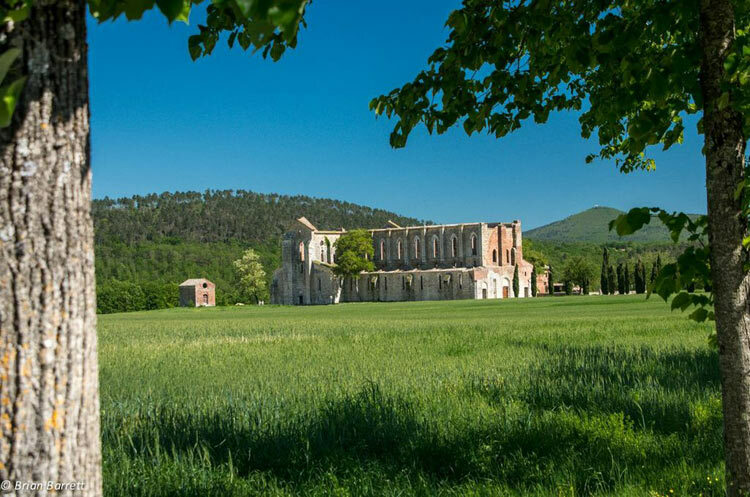 San Galgano Abbey is easily reached from our village with a short 25 minute drive. Fascinating article and photos. I’ve been to the Abbey but didn’t know the story. Now I want to return there and to your village too.